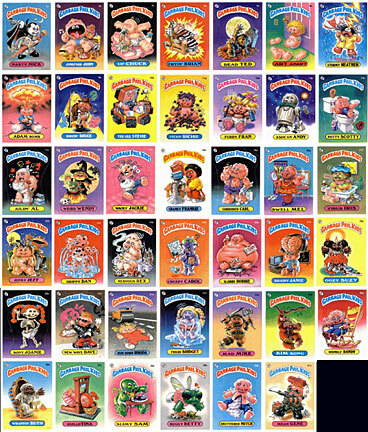 The Topps Chewing Gum Company published over 600 Garbage Pail Kids stickers between 1985 and 1988. 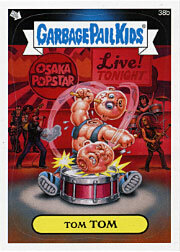 Garbage Pail Kids stickers spoofed Cabbage Patch Kids and other dolls, and were famous for their outrageous gags and gross humor. 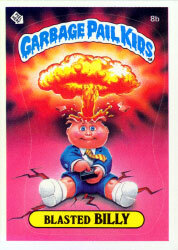 GPK stickers were published in many countries, but they were also banned in many schools. The major GPK artist was John Pound, who created idea sketches, pencil art, color roughs, and final paintings for hundreds of GPKs. Other GPK artists include Tom Bunk, James Warhola, and Jay Lynch. See GPK sites on the Links page for much more detailed information. 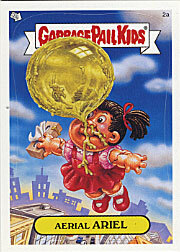 In 2003 Topps began publishing new GARBAGE PAIL KIDS. The first series (2003) included new art and previously unpublished art (from the unpublished Series 16). Artists include John Pound, Tom Bunk, Jay Lynch. Topps has continued publishing "All-New Series" GPKs since then. They have added bonus cards, sketch cards or other novelty inserts, and cards with codes for using interactive features on the Garbage Pail Kids World website. 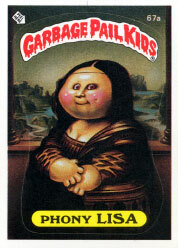 The all new GPK 7th series (ANS7) was published in early 2008, with new art by the GPK artists. 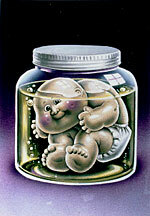 The artwork shown here was the very first Garbage Pail Kid ever made! 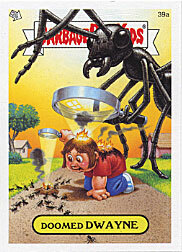 It was painted by John Pound for Topps' 1985 series of Wacky Packages, but it was never published. 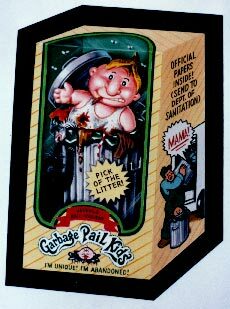 A few days after this painting was completed, Topps asked John Pound to begin creating idea sketches and paintings for a new sticker series, to be called "Garbage Pail Kids". 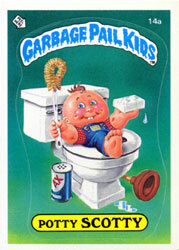 Occasionally Garbage Pail Kids paintings were created but were rejected by Topps, and never became stickers. Those shown above were painted by John Pound. They were eventually published in 2010, in the GPK Flashback series, in the "Lost GPKs" subset (numbers 65, 66, 67).